State education leaders are urging Washington to scrap plans for labeling schools as subpar if more than 5 percent of students refuse to take Common Core standardized tests — a move they say would inflame an already heated situation. Elia sent a letter to the federal agency on Monday calling for more flexible rules allowing New York and other states to create their own methods for persuading parents that children need to take the tests. Representatives of some school groups, at the state level and on Long Island, used stronger language in dismissing King’s plan. They noted that a record 21 percent of students statewide in grades three through eight opted out of English and math exams administered in April, and that the vast majority of schools fell short of the federal requirement that 95 percent of students be tested. “New York State bears the distinction of leading the nation as the ‘hotbed’ of test refusal activism,’” Charles Dedrick, executive director of the New York State Council of School Superintendents, wrote in a letter to King. Last month, King — who preceded Elia as New York’s commissioner — issued draft regulations that would put into effect the Every Student Succeeds Act, or ESSA, a revamped education law signed by President Barack Obama in December. 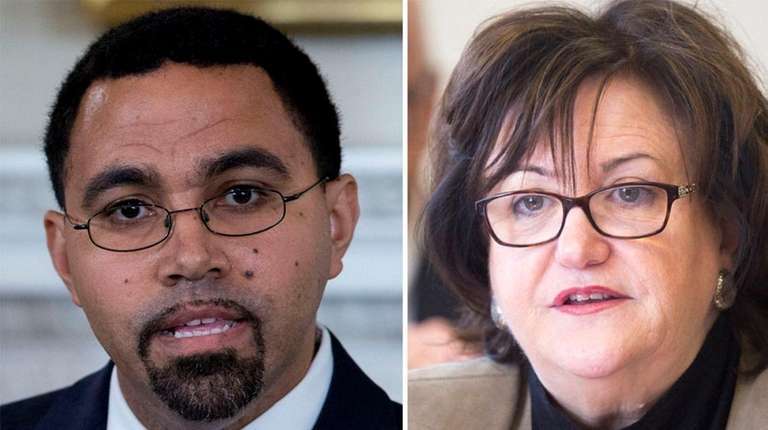 The federal department set an Aug. 1 deadline for public responses, which included letters this week from Elia, Dedrick and thousands of other education representatives nationwide. The proposals would address the test-participation issue in two major ways: Schools would be assigned “summative” ratings — for example, letter grades such as A, B, C, D or F — that assess their overall academic performance. Those schools falling short on test participation could see their ratings lowered and be required to make improvements. A spokeswoman for the federal agency, Dorie Nolt, said Tuesday that no timetable has been set for amendment of the proposed regulations or for final approval. ESSA, which won bipartisan support in Congress, was widely billed as an effort to provide more authority for states in setting academic standards for schools. King drew some criticism in Washington last month when he released the proposed regulations. Reaction in Congress broke down largely along party lines, with Republicans charging the secretary had overreached his authority, while Democrats said the new rules were needed to ensure that struggling students do not fall between the cracks. King himself said that 95 percent test participation was an essential tool in keeping parents informed of students’ progress. The threat of low ratings hit a particular nerve in suburban areas such as the Island, where opt-out rates run high. Local school representatives said such ratings could be misconstrued as evidence of low academic achievement and result in lower home values.